The use of natural dyes, including indigo, has been practiced in the tropical islands of Okinawa since the 14th century. Unlike in mainland Japan to the north, the native indigo in Okinawa is extracted and processed via fermentation. The heat extraction process is used to extract the green and blue pigment from the plant leaves. 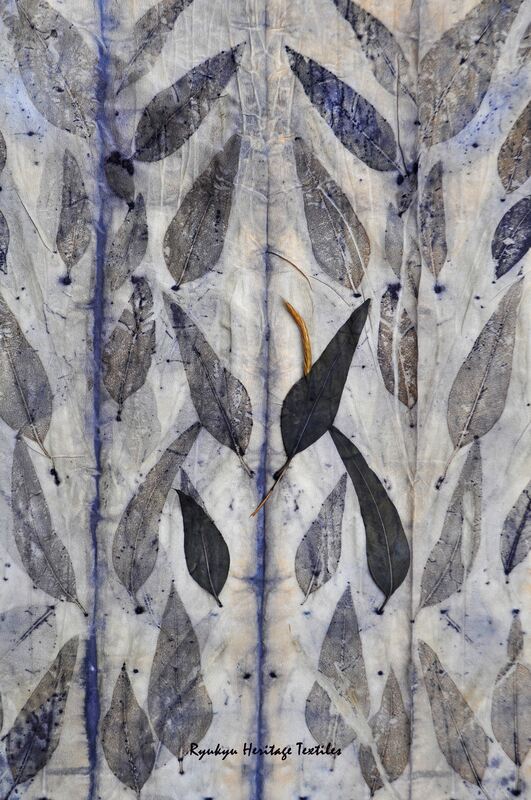 When similar extraction processes are applied using a variety of botanicals, the surface design results on fabrics are beautiful. 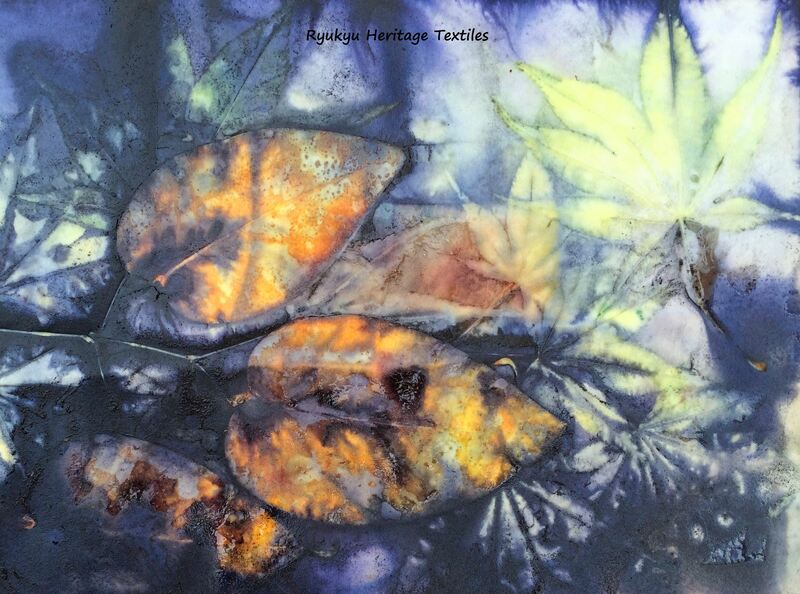 We get botanical imagery and color blending designed by both the fiber artist and mother nature hand-in-hand. This is the magic of organic dyeing! Workshop attendees will learn and practice different organic dyeing techniques including eco-dyeing and botanical printing. A variety of botanical and natural pigments will be utilized for optimal color extraction, color blending and printing results. In addition, there will be instruction and hands-on practice on the following: methods for folding and binding our fabrics to optimize color and design; and, methods for adding supplementary surface design and texture. The workshop learnings may be applied to a variety of fabrics including silk, cotton, linen, wool/felt and paper. Each participant will have time to plan and design their own pieces. We will reconvene as a group to continue our work started on Day 1. In addition, we will view our results for the first time and document and share our results with all the workshop attendees. These are important days with many takeaway learnings. The Magic of Ryukyu Ai (indigo) Workshop is an opportunity to learn about ancient indigo dye techniques that my family from the Yanbaru Forest in Okinawa-Japan have practiced for over 4 generations. Indigo, has been used as a natural dye source in the tropical islands of Okinawa – Japan since the 14th century. Unlike in mainland Japan to the north, the native indigo dye in Okinawa, known as Ryukyu Ai, is extracted via a multi-stage fermentation process that yields a beautiful and versatile doro ai (pigment) and ocean blue indigo dye. Ryukyu Ai may be used in many traditional and contemporary surface design techniques including Bingata (a 15th century rice paste resist and stencil design method), Ryukyu Kasuri (ikat) handweaving, shibori, and botanical printing. Hence, the Ryukyu Ai vat, itself, offers ample opportunities to explore creative applications on cloth and paper. In this workshop, participants will learn the Magic of Ryukyu Ai (indigo) lifecycle from plant to fermented indigo vat to textile. The workshop may be customized (1-3 days) incorporating bingata, shibori, japanese bookbinding (artbooks), or Ryukyu Kasuri handweaving. I’m also teaching an online version of the dye workshop described above*. Six (6) techniques are covered over a 4-6 week period. Dye technique instructions are provided one day per week followed by 1-2 hours of online discussion. Students practice the technique on their own time during the remainder of the week. Contact me for a quote. The cost includes a start-up kit to help you get started with your eco-dyeing and eco-printing surface design needs. Contact me if you’re interested in organizing a workshop in your preferred location or if you’re interested in participating in the virtual workshop. Meanwhile, let’s enjoy a joyful and colorful year with lots of botanical dyeing! Looks wonderful Scharine. Just exactly my interests..am in Seattle though and will follow your postings here and on FB! so glad to read your blog of the wonderful culture and pictures. I would be very interested in a virtual workshop. Are you still offering this? It’s so nice to hear from you. Yes, I am still offering the virtual eco-dye workshop. May I contact you via email? I’d like to learn more about your eco-dye interests and goals. My email address is RyukyuHeritageTextiles@gmail.com. Looking forward to discussing details about the eco-dyeing virtual workshop with you!